Morakniv Classic 1891 Kitchen Knives are handmade and beautiful. Morakniv has taken the qualities that have made their knives so prized by the campfire and joined them with the modern chef's needs; the result is a series of timeless and highly functional kitchen knives handmade in Mora, Sweden. 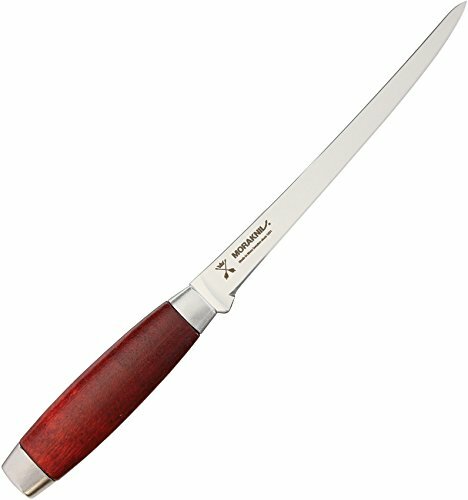 Morakniv Classic Kitchen Knives feature high quality Sandvik 14C28N stainless steel blades. This top-grade steel features excellent edge performance, razor sharpness, high hardness, and exceptional corrosion resistance. The knives have excellent balance and a beveled tip that allows safe handling and prevents stick injuries. Morakniv Classic 1891 Kitchen Knives are available in a 8.7-inch Chef’s knife, 9.7-inch Bread knife, 7.4-inch Fillet knife, 3.3-inch Paring knife, 5-inch Utility knife, and as a set of three knives (Chef’s, Bread, and Paring). Handles are of stained Swedish birch and are available in red or black. These precious kitchen tools should be hand washed only. Made in Sweden. 1-year warranty.